The automotive world is experiencing the most substantial change since Henry Ford industrialized manufacturing a century ago. KPMG highlights that the current transformation is triggered not only by technological trends but also by social trends . It appears that our future will be all about accessible mobility: mobility solutions will be more flexible, individualized, and compatible. Let’s take some time to consider what innovations are driving this new automotive revolution. Current ecological, social, and technological trends are encouraging innovative manufacturers to offer consumers much more than a metal box on four wheels. Whereas for the past 100 years, carmakers were largely focused on enhancing manufacturing to become more efficient at scale, the future is about redefining the role of the vehicle. Now it’s a smartphone on wheels, and Tesla is heading the group of industry leaders guided by this brand-new mindset. It’s rather odd that at a time when Tesla updates its car software over-the-air, many other automotive manufacturers are still producing cars with DVD players. The automotive industry is led by innovative ideas, and is ready to transform and evolve rapidly. The traditional waterfall approach to software development no longer fits the automotive industry. As cars become computers on wheels, the amount of software in them is expected to triple in the next 15 years . Automakers need to be able to roll out digital products and services quickly to address customers’ ever-evolving needs. Now it’s all about agile and two-speed R&D . The pace of modern production is staggering. Commenting on this, Asutosh Padhi, a senior partner at McKinsey, says: “The automotive industry will see more disruption in the next ten years than it has seen in the last fifty years. And it’s not only about [the] head unit of a car. It’s also about [the] production process and its up to market time” . If you don’t want to lag behind, you should be ready to adapt and eager to bring innovation into your production processes. In addition to lean and agile principles, there’s another frontier opening up called Industry 4.0 . The question here is, will the automotive industry, on top of all this disruption, take advantage of the capabilities that are coming from Industry 4.0, which promises unprecedented amounts of data and analytics, providing opportunities to increase productivity. New technologies open new opportunities. Additive manufacturing, also referred to as 3D printing, is a great source of product innovation . In 2019, automotive industry representatives will have to make the most of 3D printing in order to compete with their rivals. Metal 3D printing is already becoming mainstream . Automotive leaders also say that using software in car development can triple the speed of new model manufacturing. BMW uses digital simulations and virtual validation to eliminate the need to produce 2,500 prototype vehicles for each model . Using artificial intelligence in vehicle production can boost manufacturing productivity by 39 percent . Epicflow is one of the modern project management systems that can help you improve resource management. This tool can enhance the flow of your production processes by giving you information on the real-time progress of your projects. The growth of zero emission vehicle technology has been driven by environmental factors. The popularity of cleaner and more environmentally friendly electric vehicles (EVs) and hybrid electric vehicles (HEVs) is increasing. There are more than 5.6 million EVs on the road today, which is 64 percent more than in 2018 . By the year 2030, 55 percent of all cars sold in Europe will be fully electric . Tesla is still the most influential EV manufacturer, but other automakers are appearing — and they presented many stunning electric cars at this year’s Geneva Motor Show. Will there be a real competitor to the Tesla 3? Electric vehicles are promising, but only if you get the energy from a renewable source. Today, people get 90 percent of their electricity from coal plants, which only shifts emissions to a different location . Lex Hoefsloot, a co-founder of Lightyear, suggests not spending our time building infrastructure for electric cars and instead focusing on combining an energy source and a car . This summer, Lightyear will be launching their prototype of a solar-powered family car. It promises impressive performance: over 1154 kilometers with zero charging and zero grams of CO2 emitted. The Epicflow resource management system supports Lightyear in their disruptive innovation. Developing autonomous vehicles will require deep expertise in AI and machine learning. Considering the modern boom of automotive startups, it’s reasonable to partner with machine learning leaders. Toyota has recently partnered with Nvidia to create a self-driving alliance . Infrastructure plays a considerable part in the development of autonomous driving. According to KPMG, the Netherlands, Singapore, Norway, the United States, and Sweden are among the countries most ready for autonomous vehicles . Singapore has already welcomed the world’s first full-size autonomous electric bus on its streets on March 5, 2019 . The bus was launched by Volvo and the Nanyang Technological University. With this trend, driving will become more accessible, cheaper, safer, easier, and time-efficient. KPMG has named digitalization and connectivity among the key trends changing the future of driving . It seems that 5G technology will facilitate this, turning your car into a talking and thinking supercomputer quite soon . Cars will be able to create wireless networks to communicate with all traffic infrastructure, which includes vehicles and traffic lights. Wouldn’t it be great if your car could give you suggestions on the optimal speed for driving in a green corridor? Innovative software will create intelligent traffic systems, which promise to avoid collisions, send emergency vehicle notifications, perform remote monitoring, provide car diagnostics, and manage parking . With vehicle-to-everything technology, cars will receive real-time traffic notifications, accident alerts, and other warnings . This technology will increase traffic safety, detect obstacles, assist with lane changes, send forward collision warnings, and offer other safety measures. Сonnected computers on wheels will generate massive amounts of data. It’s estimated that cars will soon have 200 million lines of code . Just to compare, Facebook has around 50 million lines of code. Automotive manufacturers might also need to consider data monetization . KPMG suggests car companies monetize data in order to think of safety before performance . Companies that combine cutting-edge thinking with environmentally friendly technology will soon be recognized as leaders in mobility. Be ready to innovate and invest time and money into these latest trends in the automotive industry to open up a new universe of profits. Sign up for an Epicflow demonstration and discover how this resource management system can help you reach new milestones. Сontact us at epicflow@epicflow.com or call +31 20 241 7152. KPMG: The Future of the Automobile Industry. 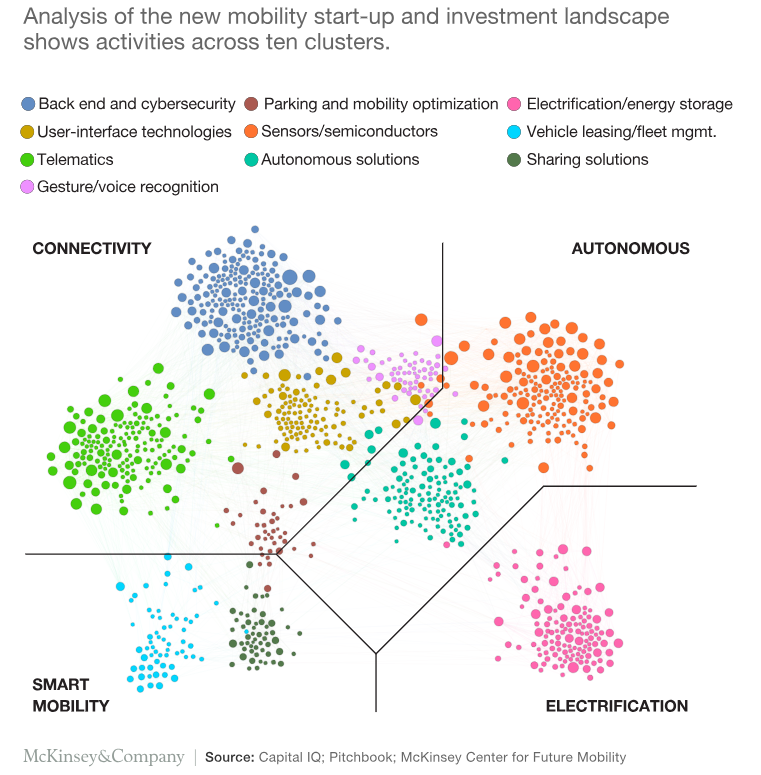 McKinsey & Company: How the auto industry is preparing for the car of the future. McKinsey & Company: Getting the most out of Industry 4.0. Deloitte University Press: 3D opportunity in the automotive industry. 3D Printing Industry: 40 3D printing experts give predictions for additive manufacturing in 2019. Reuters: BMW plans to cut costs after warning on profits. IT2Industry Blog: 3 Areas Where AI Can Boost Productivity Of Mechanical Engineering. The Driven: There are now 5.6 million electric cars on the road, up 64% from last year. PWC: Five trends transforming the Automotive Industry. Carbon Brief: Mapped: The world’s coal power plants. Lightyear: The electric car that charges itself. Allied Market Research: Autonomous Vehicle Market Overview. TheStreet: Why Nvidia Partnering With Toyota Is a Big Deal. Verdict: The Netherlands comes out on top for autonomous vehicle readiness. Buses Global: NTU Singapore and Volvo unveil world’s first full size, autonomous electric bus. KPMG: After two years in second place, connectivity and digitalization is now back as the number one key trend. Market Research: 6 Major Automotive Industry Trends That May Surprise You. McKinsey & Company: Fueling growth through data monetization. KPMG: Global Automotive Executive Survey 2019.